Why Your Car CV Joint Noisy? Your vehicle have powerful motor made for giving excellent performance. The CV joints are one of the most essential parts of your vehicle as it is integrated with the engine to give a smooth movement. If the CV joints are not cared for properly they can derail and the vehicle’s performance will be affected. Many car owners make careless mistakes with the joints and that causes the vehicle to lose its optimal performance while also costing more. Here are several free advice you need to avoid making when it comes to maintaining your car CV joints. Car owners usually leave vehicles unchecked for months and this could lead to dust and debris being accumulated in the engine. The CV joint is forced to rub against this debris and this causes friction which in turn gives a rough drive instead of a smooth drive. You must check the engine and your CV joints after every few drives to ensure that there is no gathering of dust and hard materials. You should regularly maintain both the interior and exterior of your vehicle if you want it to shine and sparkle along with giving off first class performance. Your car chassis is one part that is most often overlooked and this is where most of the debris and mud gather. Mechanics usually consider a dirty debris accumulated chassis to be the root of all mechanical disasters. It is important that you regularly clean and maintain the chassis twice to thrice a month. If you neglect this step and keep it dirty, your engine will suffer a breakdown and end up costing you a hefty amount for a good repair. While applying oil, make sure it is neither too much nor too less. Also make sure to check the engine as well as the joints and the areas around for any sign of oil leakage. Take your vehicle to the mechanic if there is any sign of leakage. Always be sure of the quantity of oil applied. It should be good enough to prevent friction but should not be over applied as that can cause leakage. Always create a proper maintenance schedule and stick to it. Take care of your vehicle and avoid mistakes that will prove costly and become a hassle for you in the future. I, Fouzi thank you for subscribing and visiting my website. My Car Symptoms, is my new e-book subscribe now is FREE. If your car is in need for FREE oil leak check contact me at Fouzis Service Centre for free quotation and prices. 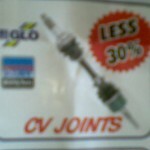 I have special on CV joint, CV boot, FREE wheel alignment if you fit 02 outer CV joint . You can buy your CV joint and CV boot from this auto parts stores click here. You will find all parts for your car. 01/02/2012 Posted by Fouzi Bach | Uncategorized	| Automobile, careless mistakes, Citroën 2CV, Constant-velocity joint, cv joints, Fouzis Service Centre, hard materials, oil leakage, Vehicle | Comments Off on How CV Joints Work? What to Do When Your ATV’s CV Joints Fail ? A description of the parts that need to be checked and/or replaced when you change your ATV CV joint; and how to do it right for the most cost-effectiveness. We’ve all been there. You know that dreaded clicking and popping sound during a turn or while under load that causes you to realize that your ATV CV joints are done for. They need to be replaced but make sure you also check your CV boots for looseness, cracks or tears. Damaged CV boots are a pretty good indication that dirt or water has mixed in with your grease – if it hasn’t all leaked out. Torn outer ATV CV joints can also be hard on your wheel bearings because dirt or water probably has leaked in or grease has leaked out and the bearings have been run dry. This will ensure that you only have to do the job once. It may cost more up front but it will save you time, money and hassle in the long run. Always use a high-quality new replacement CV joint and heavy-duty replacement boot. This will insure that you will have many more miles of trouble-free riding. If you want to use recondition , or used cv joint checked first before you fitted. Just one question here for you : How long you going to drive your car with such parts ?. Don’t pay twice for same parts . I, Fouzi owner of Fouzis Service center thank you for visiting and subscribe to my website for free info, news letters and free quote.If you looking to buy your own parts : you can find better prices only here . I will help you to fitted .